You are here: Home / rewards programs / Pampers Gifts to Grow / Pampers Gifts to Grow: 20 new points or 300 points for new members! Pampers Gifts to Grow: 20 new points or 300 points for new members! If you’re not familiar with Pampers Gifts to Grow, you can enter codes from Pampers diapers, wipes, and training pants and accumulate points that can be redeemed for rewards. You do not have to use Pampers or have kids in diapers to enter the freebie codes and take advantage of this program! I signed up for this program when my oldest (who is now 8) was in diapers. I haven’t had a kid in diapers in almost 3 years now! Even though my kids are beyond this stage, I still enter the bonus codes when they come along and collect freebies! In the past year, I’ve earned almost 1,500 bonus points just by entering the free codes when they come along! I typically save mine until they have gift card offers, but you can also get Shutterfly items, toys, Diapers.com codes and more! 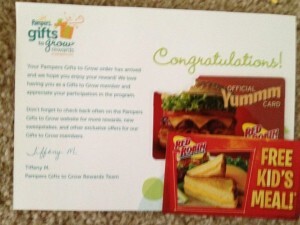 I recently cashed out for a $10 Red Robin gift card and FREE kids meal! (this offer is not currently available, but they add it back a few times every month, so keep your eyes open!) I look to see what new rewards are available a few times each month. Just a Note: The gift card offers usually go quickly, so you have to be on top of it to grab them! Here’s how you can potentially score 280 more points right away! If you know of any other codes, let me know so I can add them to the list! Pampers Gifts to Grow: 15 new points or 300 points for new members! 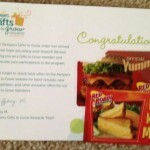 Pampers Gifts to Grow: NEW 15 points codes plus 295 points for NEW members! Pampers Gifts to Grow: NEW 10 point code + 300 points for NEW members! Pampers Gifts to Grow: new 5 point code plus 290 points for NEW members! NEW Pampers Gifts to Grow 10 point code PLUS 300 points for NEW members!